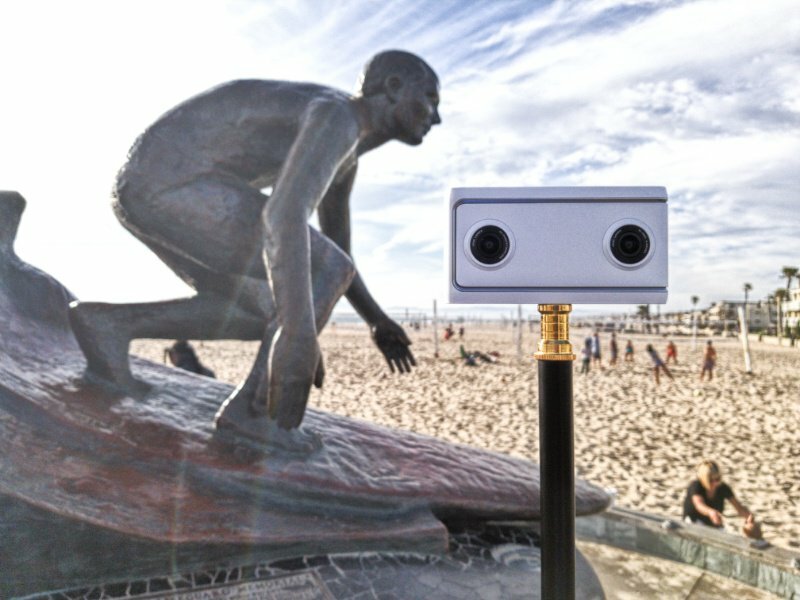 Humaneyes launched the Vuze XR, a 5.7K 360 camera that converts to a VR180 (3D 180) camera. At $439, it is one of the most affordable 5.7K 360 cameras on the market. I’ve been using it since December 2018 and here is a detailed hands-on review, including specifications, sample videos, sample photos, its advantages and disadvantages. The Vuze XR is a new 360 camera that converts into a VR180 camera (XR stands for Cross Reality). 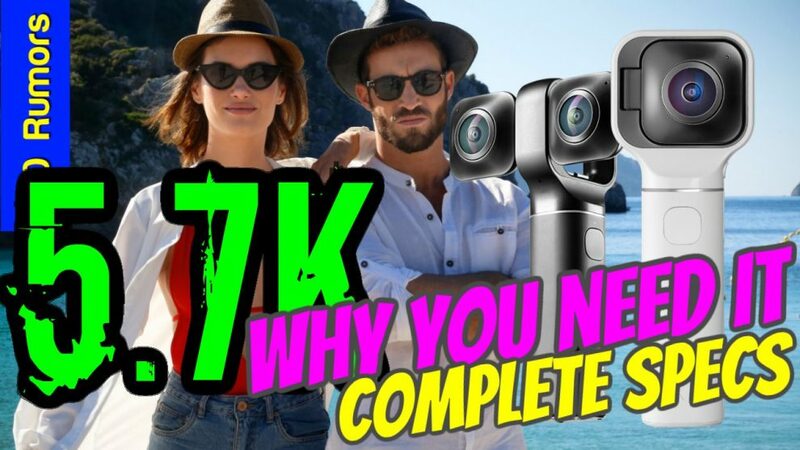 It’s not the first such camera, but unlike other hybrid VR180 cameras such as the Kandao Qoocam, this one has a 5.7K resolution, and will cost just $439, making it much more affordable than other 360 cameras the GoPro Fusion ($699, 5K) or Garmin Virb 360 ($799, 5.7K). What is VR180 and why is it so interesting? The key feature of Vuze XR is that it can convert from a 360 camera to a VR180 camera. 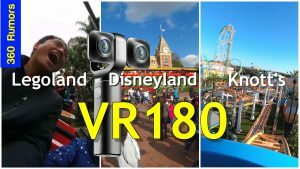 VR180 is a 3D 180-degree format for photos and videos. It’s exciting for several reasons. First, it’s immersive. A photo or video in 3D 180 looks very immersive in a VR headset, more so than a 2D 360, in my opinion. Although it doesn’t provide a 360 view, heatmaps show that many people tend to look only in the forward direction of a 360 video. Second, it’s much easier to shoot, especially for narratives. 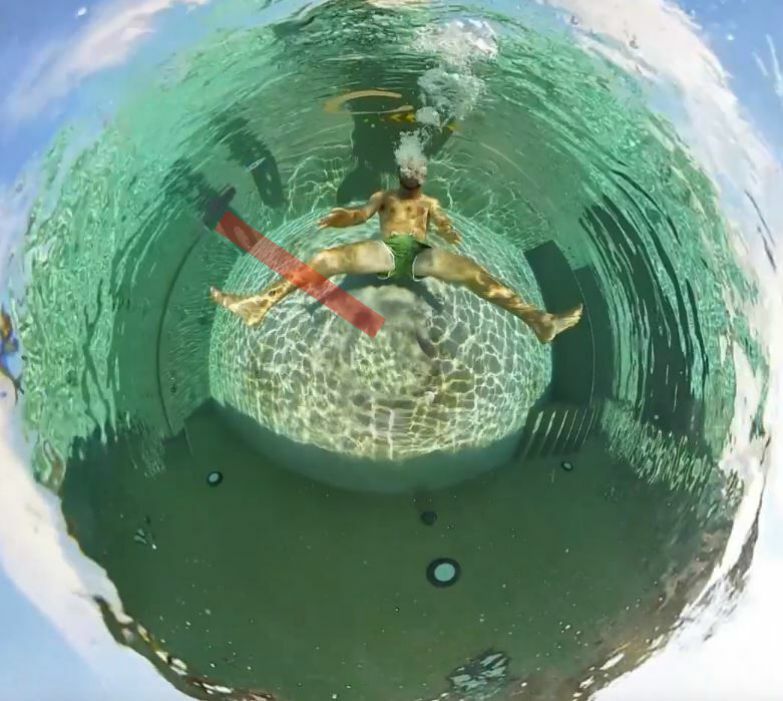 One of the challenges of shooting in 360 is that it requires an entirely different shooting technique. It’s hard for the director to force the audience to look at a specific direction. Even audiences can get confused and wonder whether they are missing out on what the director really wants them to see. There are also other challenges. For example, you normally can’t employ lighting because the lights would be visible in the shot. With VR180, the camera shows only the front hemisphere, which means the director and shooting equipment can stay behind the camera and remain hidden. That’s one of the reasons VR180 is appealing to many VR video professionals. But even casual users will find shooting in VR180 much more familiar and similar to how they shoot with a smartphone. I have three VR180 cameras at the moment, the Kandao Qoocam, Lenovo Mirage (reviewed here) and the LucidCam (samples here). I love the photos and videos that I’ve captured with them. But there are times when I do prefer a 360 view, such as to provide excellent stabilization (VR180 cameras don’t have the amazing stabilization of a stabilized 360 camera). The Vuze XR, with its ability to convert from 360 to VR180, could be perfect for both types of videos. Here are detailed specifications for the Vuze XR. It will have have an optional waterproof case. The video has an underwater scene where the stitching is not perfect but seems passable. The Vuze XR does have gyro-based stabilization in 360 mode. You’ll be able to render stabilized videos with either the desktop or mobile app. The Vuze XR app has animated 360 stamps and filters. If you place a stamp somewhere in the 360 photo, it will appear to be anchored to that position as you change the view of the 360 photo or video. Here is a sample video that includes sample VR180 videos, VR180 photos, 2D 360 stabilization, VR180 stabilization, low light videos, and low light photos. To view this in 3D, please view on the YouTube app on your phone, or on YouTube VR on your VR headset. Here is a sample video showing how well the Vuze XR’s stabilization works. The demo looks very convincing. The video also appears to show that the Vuze has excellent highlight range. 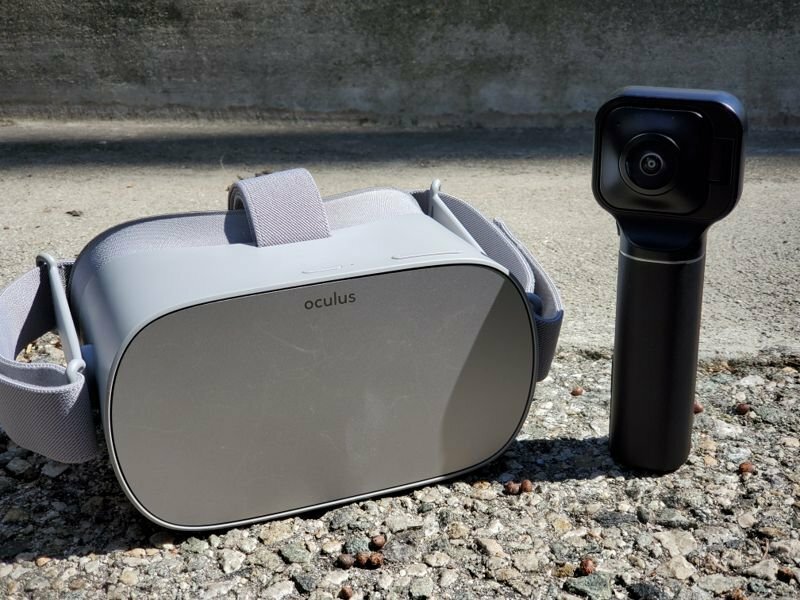 You can now view Vuze XR photos and 4K videos wirelessly on Oculus Go. To use this feature, you need to update the firmware. 1. Download the Vuze XR firmware (version 1.2.52426 March 19, 2019 or later). To install it, copy the firmware to the root directory of the Vuze XR. Ensure that the XR has adequate battery life, then with the XR turned off, insert the memory card. Turn on the XR. The power button will keep blinking during the update. Do not interrupt this process. The XR will reboot itself and you will hear three beeps indicating a successful update. 2. To use the new feature, double click the Wi-Fi. Instead of a white LED, it will show a blue LED. 3. Connect the Oculus Go to the Vuze XR wirelessly. You can do this from within the Oculus headset (from the Settings, select Wi-Fi and select the XR’s signal). Alternatively, you can go to the Oculus smartphone app and under settings, select the Oculus Go and tap on Wi-Fi to select the XR’s wireless signal. 4. Launch Oculus Gallery app. The Vuze XR will appear as a separate drive. You will be able to view videos in 4K 30fps (either 360 or VR180) or photos. 4k60 or 5.7K videos are not yet viewable with this method. Vuze XR will be $439 direct from Humaneyes or through Amazon or through B&H Photo, and was released in November 2018. Here is the official website. Vuze XR will compete with a few other 360 cameras that can convert to a 3D 180 mode, including the Kandao Qoocam, which has a lower 4K resolution but has other features such as depth mapping, refocusing, and background replacement. Another competitor is a foldable Kodak PIXPRO camera shown at CES 2018 (temporarily called 3D 360 VR camera). I will keep this post updated as I get more new info about the XR. You can receive free e-mail alerts here. You can also join the growing community at the Facebook VR180 group. 🙂 hmm Fusion might indeed be better, but i’m curious how you concluded that Fusion is better? Fusion doesn’t offer the option of VR 180, which is what this camera is all about. The point of the Vuze XR’s design is to also be able to shoot VR180 which is a 3D format. Yes 3d 360 and 3d 180 are both 3d formats but they are also VR formats. I was responding to Dmitry comparing the Fusion with the Vuze XR. Only the Vuze XR is capable of shooting in VR180 as well. Any word on frame rates? Ability to shoot Manual vs Auto? Do you know anything about photo resolution and quality? Sometimes photo with great resolution is better than poor video for headsets especially. I am also curious about that. But I am equally curious about sync. With each new VR180 camera brought on the market, I wonder how well left and right images will sync in video mode as well as stills mode. The LucidCam for example provides horrendous results in either mode. Neither video or stills are in sync. The first Qoocam clips were also badly synched but the latest one “at the zoo” seems to be much better. However one of the stills they show is badly out of sync. Mirage video clips seem to have good sync and the stills I have seen did not seem to have any sync errors but none of those I saw had much motion in them so I don’t know for sure. Been waiting for this for days now so thanks but disappointed it’s not a new Ricoh Theta which must surely be due in Q4 as in previous years and announced prior. Looking forward to one of your excellent detailed reviews. Very interesting. I still have mixed feeling about what I see from the Mirage Camera. I noticed that now non-VR versions of the videos are labeled “720p” at max. I hope 5.7k videos will be counted as 1080P videos for the non-VR viewers. Getting viewers on board with 360 has not been easy. I think reframing videos has greatly changed the 360 camera game by giving creators ways of sharing amazing videos with everyone. Google definitely screwed up their VR180 format. But the 3D 180 idea itself is viable. 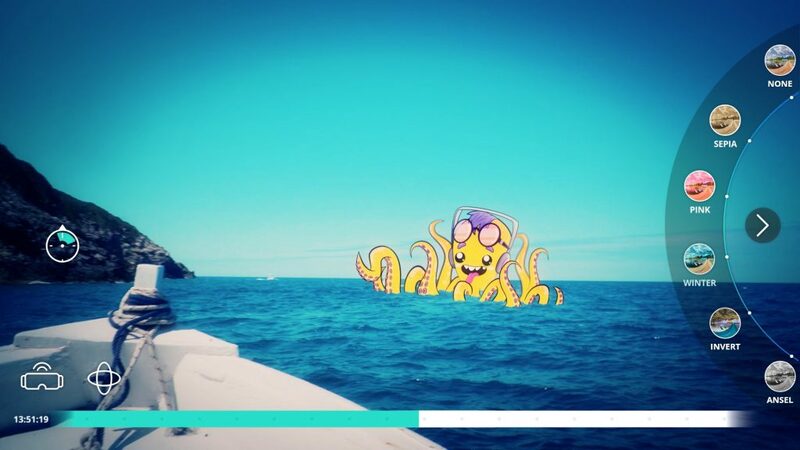 It just needs to be in conventional equirectangular top-bottom format for both photos and videos. Screw Google’s half-assed VR180. Without a doubt! It is sad to see Google drop the ball. VR180 videos are amazing (look at the Amaze 3D app on Occulus or Daydream platforms)! With YouTube being such a big player in the video hosting game it is sad to think that I’m not looking forward to using it for VR180. Exactly! I have the Lenovo camera, and every 4K video I uploaded to Youtube from it starts off as 4K, but within a few hours its been downgraded to 720p by YT, its maddening. @Mic, have you experienced this? The worst part is there is no way to reach out to YouTube to ask about this, apparently I’m not “eligible” for the ‘Email Creator Support Team”. I’m strongly considering returning the camera at this point. Not only 720p but 2D only ! The way they had it just a few weeks ago was working fine and we could download the 4K 3D version. Now, the 3D version is so well hidden that nobody will even know the original is 3D VR. One thing I should add however is that the recent demo clip for the new VR Photo Converter does come up as 3D VR only (no 2D version) but again – at maximum 720p resolution. Hopefully, YT will restore it to the way it was as, right now, they are killing their own new medium. Interesting indeed! And being a Vuze, which is already available in Europe, will it also be available here? Perhaps i’ll skip Mi Sphere and wait for Vuze XR. Tried to order Mi Sphere from Aliexpress but the order proces didn’t work. Hi Frank. Yes I believe i will be available in EU and UK too. What I don’t know is whether they can stick to their Q4 promise. The Vuze was delayed many months. > What I don’t know is whether they can stick to their Q4 promise. Statistically, it doesn’t look good. Lucidcam was at least a year late. As I remember it, the first VR180 cameras were slated to show up in Q4 2017 yet only the Lenovo Mirage showed up… but in May 2018. And the Yi – announced for spring – is now held back till around October. And what about that LG VR180 camera announced in June 2017 ? Not even a word about it yet. 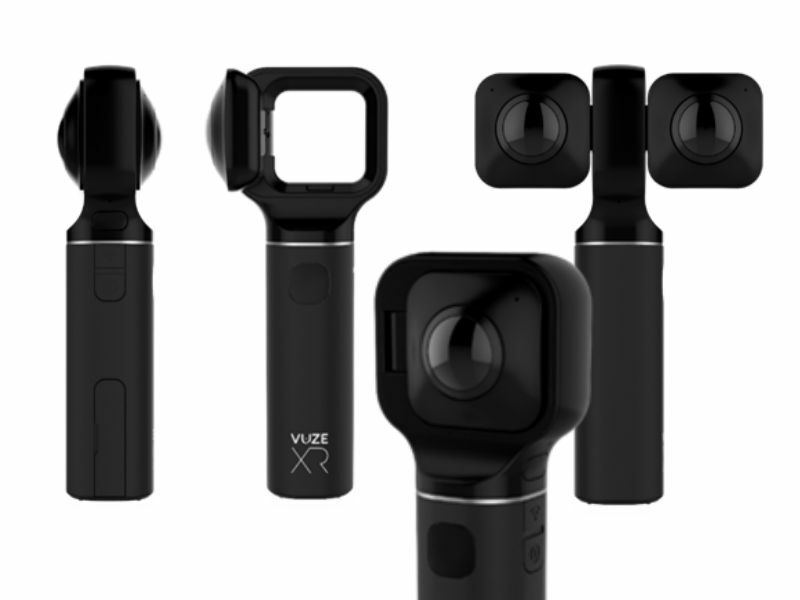 Probably more VR180 cameras will be announced by the time the Vuze XR hits the market. I was expecting to see a “surprise” entry in the VR180 arena but definitely not from Human Eyes. I thought the most likely next contender would have been Insta360 – given they did produce at least two 3D 180 prototype in the last few years. The Vuze XR design seems to be a strange mix between the Kodak “Butterfly” and the Qoocam. It converts to VR180 like the Kodak does but has a handle like the Qoocam. It does appear that the lenses are more forward of the handle than those on the Qoocam when in VR 180 position and therefore less likely for the lenses to see the fingers wrapped around the handle. But we still need to see clips and stills to judge IQ and sync. In spite of the increased versatility of those two-mode cameras, I still prefer a straight VR180 camera in a regular rectangular body with an LCD display at the back – such as Yi is proposing. Hi Francois. For me, i’m a fan of 3d 180 format, but there are times when i want maximum stabilization, or sometimes i dont want to have to aim the camera. For that reason i like the versatility of cameras that can convert from 3d 180 to 360. I do realize companies might feel it’s less of a risk to produce a camera that offers both options because they can reach both markets. But personally, I still feel I would choose a camera like the Horizon over the Vuze XR s I don’t have to be holding my phone to check what the camera is seeing. Yes but I’m trying to put myself in the shoes of a consumer, who likely will buy only one camera. It is better for the consumer to have the option for both 360 and 3D 180. Even myself, in casual situations, I would prefer to have just one camera. I don’t want to have to choose between a 360 camera or 3D 180 camera. I want a camera that can do both! For some, yes, they might prefer the twin modes. And I can imagine someone wanting a 360 camera appreciating the fact that he would also get a VR180 camera at the same time. But then, there is also the choice of handling one camera with a built-in display/touch screen and having to handle both a camera and a phone. I prefer to have access to all the controls right on the camera. I also happen to prefer the form-factor of a camera. But I understand why some might prefer to have both cameras in one body although I think it’s mainly a marketing ploy on the part of the manufacturers. The question is whether the Vuze XR is also supported by Google? What app will be available. I’m more concerned with workflow than specification. I don’t just want to make test videos, I want to tell stories. SBS is a format for traditional 3D, which to me is dead, even though i like it. I believe VR must distance itself from being seen as ‘another version of 3D’ if it is to survive. As a 3D photographer for many years, needless to say, I strongly disagree. SBS is the most logical way to place a left and a right image – makes it much more universal for viewing. I don’t see how VR180 can distance itself from 3D when it is in fact exactly the same. Anyhow, that’s how VR180 is promoted: as 3D ! There is no getting around it. Seems to me that placing the images top and bottom reduces the resolution with 3D 180 images since it leaves much of the image area blank. It’s only required with 3D 360 where the entire image area is filled. > Mic wrote: For example google vr180 videos are in sbs format. So if i want to mix 3d 360 with vr180 i have to convert the vr180 into top bottom first. I fail to understand why one would want to combine 3D 360 with 3D 180 since VR180 only has a front view. Therefore, cuts from 360 to 180 would be problematic as one could be plunged in the dark at any time unless one were always looking towards the front…. > Why not just make them all top bottom? Because there is a loss of resolution when VR180 SBS is converted to top/bottom. Also, keep in mind that VR180 was conceived to appeal to the average user in terms of size and cost of the camera. Most 3D 360 cameras are out of reach of anyone but pro photographers. So I doubt that most people owning a VR180 camera would also own a 3D 360 camera. As I mentioned before, I have been viewing all manner of VR and 3D content using the Nibiru OS and this allows me to view regular, 180 or 360, 2D or 3D. All I need do is specify the format and it tags it. Thus I have been playing 3D 180 and 3D 360 as well as regular 3D and 2D without any problem. I think Google Cardboard and Daydream have just complicated things rather than made them simpler. Yet another factor is stills. They are much simpler to view as SBS and can even be freeviewed on a computer monitor. Now, for events, I uses six 4K Gear360 (2016) – as it has removable battery and very clear sound rec., with my custom made passive cooling system (powering from standard 5V power banks (11300mAh – 20000mAh), and with 256MB uSDXC card, I can record continuously up to 18h 40min.) – https://www.youtube.com/watch?v=9KYLA0WxXYY. This year I have used additionally Insta360 Pro, but its active cooling system is very annoying especially during some quiet events – like religious services – here is Latin Mass in extraordinary form (it has been served as it was before year 1968) I have recorded last year (with three Gears 360): https://www.youtube.com/watch?v=-UkSRP47MUo. I also just received an email from the Human Eyes site as I was expecting for this camera for a long time, especially for the 5.7K for 360 videos. I am quite disappointed by the quality of the sample videos they shared, my current Mi Sphere seems to be better even with lower resolution. Thanks Curt. My impression is that it less detailed than Fusion, but i think it is not worse than Mi Sphere. When I viewed the sample VR180 video on a headset, it seemed detailed enough… Anyway when i get my hands on it, i will definitely post a comparison. I wrote to Human Eyes and asked if they would offer original uncompressed sample files on their website. The problem with clips on YT is we never can be sure that they represent the true resolution of which the camera is capable. Another important point is stills quality. Human Eyes claims the XR can shoot 18mp stills, which is much higher than what Qoocam can do. But we need to see the IQ at 18mp. So I asked for stills samples as well. I like the fact that this appears to be a much more compact and clever approach to VR180/360 than the Qoocam. The Kodak version (if it is ever released) is even more compact but would still require some form of handle to hold it. Great idea (original uncompressed sample files). Hope they will answer. Most of the camera brands do it I think. Actually, Human Eyes replied they had no plans to offer full resolution samples for download at the moment. They may do so later but probably not till after the pre-order period. As far as I am concerned, I won’t be buying anything till I see the reviews and actual video and stills sample made by reviewers or users. Thanks for the link, Charles. They did tell me they might have some samples “closer to release date”. Therefore, since it is now a month later, it makes sense they would finally release a few. Honestly, I completely forgot about this and did not write them again after my initial query. So, thanks for following up. Do you mean if you shoot in 360, later you can convert it to 180 3D? Hi KK. No, to shoot in 3D 180, you press a button that causes the lenses to switch to side-by-side position. You gotta wonder what kind of case design they can come up with that allows both 360 and VR180 shooting ! I asked Human Eyes and they said they intend to offer both a VR180 case and a 360 case. how is 5.7k video image quality compared to gopro fusion 5.2k ? Hi amanieux! My impression is that the fusion is still more detailed. But that’s just my impression – I want to test them side by side, and also vs. the one x.